What Does Volatility Look Like? 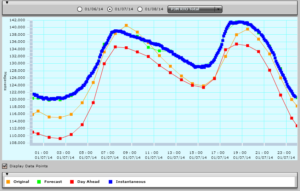 This article looks at how cold weather led to great volatility in real-time wholesale electricity prices during January 2014 in the PJM Interconnection (PJM). The month of January 2014 was the coldest in decades in the US as a Polar Vortex pushed its way into the Midwest, South, and East. 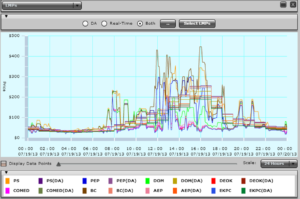 Winter electricity use in the Mid-Atlantic generally exhibits a daily bi-modal pattern, with morning and evening peaks. 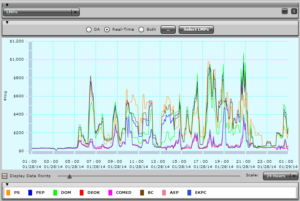 The graphic below shows total PJM load during the 24 hours of January 22, 2014. Because of the exceptionally cold weather on that day, during the morning and afternoon, real-time electricity prices were elevated, averaging about $350 per megawatt-hour. During the evening peak-demand period, as a result of the shutdown of the Calvert Cliffs Nuclear Power Plant’s two units, prices rose even more substantially. The two nuclear units, located on the western shore of the Chesapeake Bay in Calvert County, Maryland, together represent more than 1,700 megawatts of installed capacity. The outage was described by the facility’s owner, Constellation Energy Nuclear Group (now part of Exelon Corp), as the result of an electrical malfunction on the non-nuclear side of the plant. 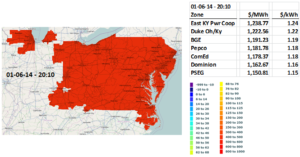 Regardless of the side of the plant on which the malfunction occurred, real-time prices in the transmission-constrained Potomac Electric Power Company (Pepco) and Baltimore Gas and Electric (BGE) Zones rose dramatically, for about a five hour period, reaching $1,890.70 per megawatt-hour in the Pepco Zone and $1,896.94 per megawatt-hour in the BGE Zone. The table below presents real-time prices in eight of the twenty PJM zones at 2050 (8:50 PM). Real-time prices are shown in megawatt-hours ($/MWh) and kilowatt-hours ($/kWh). 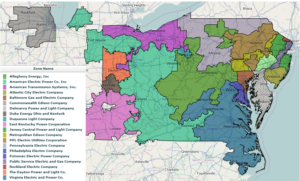 A map of all of the PJM Zones is presented at the end of this article. 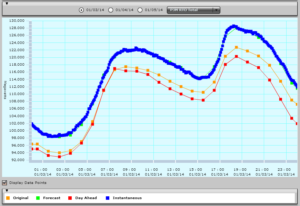 The grid operator, PJM, had been calling on demand response all day during January 22. The average demand response price (Average DR Dispatch Lambda) rose to $835 per megawatt-hour at hour 1759 (5:59 PM) as shown below. During January 23, 2014, as both the bitterly cold weather and the Calvert Cliffs outage continued, prices remained elevated, especially so in the constrained Pepco and BGE Zones. 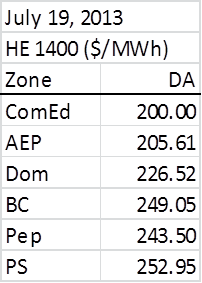 The table below presents real-time prices in eight PJM zones at 2030 (8:30 PM). The contour map below shows real-time prices exceeding $550/MWh across all of the PJM zones at hour 2255 (10:55 PM). The average demand dispatch prices reached $1,000/MWh at the same time. The following day, January 24, with the Calvert Cliffs outage continuing, real-time electricity prices exceeded $2,600/MWh in the Dominion Zone during the morning peak at 0705 (7:05 AM). 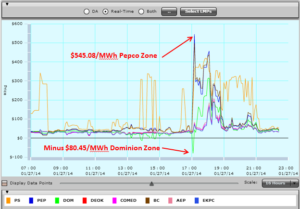 Real-time prices previously set a record of $2,450.54/MWh in the Dominion Zone on January 7, 2014. 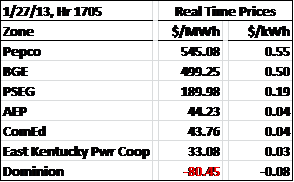 Less than two hours later, at 0850 (8:50 AM), due to a transmission constraint, a small portion of northern central West Virginia experienced negative prices while prices on the western side of PJM continued to exceed $200/MWh and on the eastern side exceeded $600/MWh. 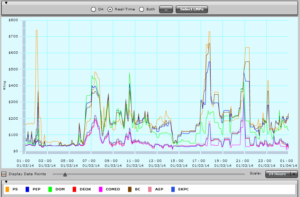 Real-time price volatility continued within PJM in even more dramatic ways. At 1700 (5 PM) on January 27, real-time prices in the Pepco Zone spiked to $545.08/MWh while real-time prices in almost the entire Dominion Zone dropped below zero to minus $80.45/MWh as shown on the price contour map below. This volatility is shown on the graph and table below. Wholesale electricity prices are volatile—more volatile than the price of virtually any other commodity. The volatility of electricity prices during January 2014 shows how much risk purchasers of index electricity products take on. In a related fashion, it also shows how much risk retail energy providers take on when they do not effectively hedge their load. It is likely that some retail energy providers will not survive this period of volatility. 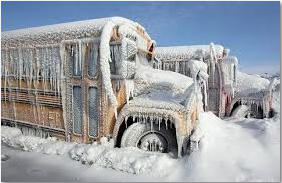 What Does an Extended Cold Spell Look Like? What Does a Cold Day Look Like? What Does a Superstorm (Sandy) Look Like? What Does a Warm Day Look Like? 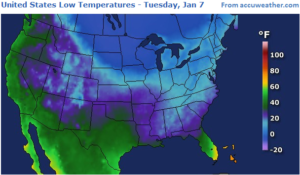 This is a follow up to our blog posted Monday evening titled “What Does a Cold Day Look Like?” and looks at the impact on real-time wholesale electricity pricing of extended cold weather. We reported that as a result of Winter Storm Hercules barreling through the Mid-West, Mid-Atlantic and Northeast last Thursday and Friday (January 3 and 4), real-time wholesale electricity prices in the PJM territory were elevated and volatile, ranging from negative prices to $739.70 per megawatt-hour ($/MWh) or $0.74 per kilowatt-hour (kWh). 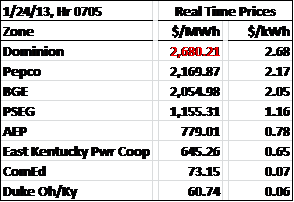 For comparison, we noted that real-time wholesale prices in PJM averaged $31.21/MWh or $0.0321/kWh during 2012. We also noted that during times of extremely cold weather, consumers pull out all of the stops. Air circulation equipment runs longer and electric resistance heating kicks in. The result is increased usage and high prices. Moving ahead to Monday and Tuesday, January 6 and 7, the weather remained bitterly cold and the Polar Vortex moved further south. The difference during this later two day period was that thermal mass (such as building foundations and walls, and the ground itself) had largely dissipated any retained heat. The result was an increase in the amount of energy required to heat buildings and homes. From 7:50 PM to 8:25 PM on Monday, January 6, real-time wholesale electricity prices exceeded $1,000/MWh across the entire PJM grid. As an indication of how far south the cold spell reached, the peak price for the day of $1,238.77, which occurred at 8:10 PM, was in the East Kentucky Power Coop Zone. 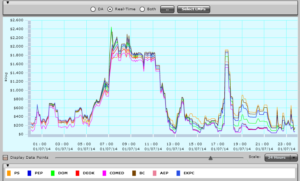 Below are PJM real-time prices and system load during the 24 hours of Monday, January 6. On Tuesday, January 7, real-time wholesale prices exceeded $1,000/MWH from 6:40 AM to 11:55 AM and then again from 5:30 PM to 5:55 PM. 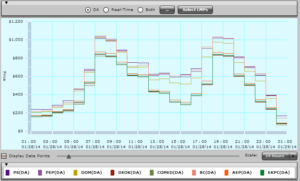 Prices peaked in PJM at 7:15 AM at $2,450.54/MWh. This occurred in the Dominion Zone. 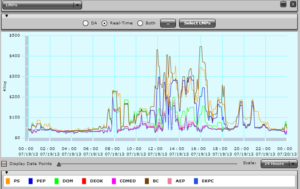 Below are PJM real-time prices and total system load during the 24 hours of Tuesday, January 7. Peak system load was reduced significantly by voltage reductions, voluntary customer conservation, and the implementation of demand response. PJM reported 38,000 MW of generation outages. Additional electricity supply was imported from two other RTOs – NYISO and MISO. 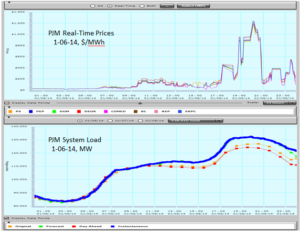 The table to the left below summarizes the PJM peak real-time wholesale electricity prices over the past four weekdays and shows the 2012 PJM total system average for comparison. The table to the right shows the PJM total system peak demand which, at 141,483 MW on Tuesday, 1/7/14, represents a new PJM winter record. The previous winter peak, which was about 5,000 MW lower, was set on 1/5/07. The all-time system summer peak of 158,450 MW occurred during the summer of 2011. 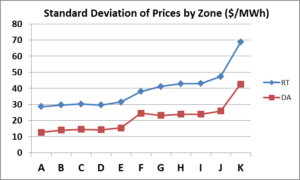 In previous blog posts, we have examined how weather and other events affect electricity prices. We continue this series by looking at how electricity prices in the PJM Interconnection area can be affected by cold weather. Winter Storm Hercules brought snow and cold temperatures to the northeast United States on Thursday and Friday, January 2 and 3, 2014. Because of heavy cooling loads, electricity usage and wholesale electricity prices in the PJM area during the summer tend to be substantially higher than usage and wholesale prices during the winter. Most air conditioners are powered by electricity whereas much of the winter heating load is carried by natural gas and, to some extent, fuel oil. However, during times of extremely cold weather, consumers pull out all of the stops. Air circulation equipment runs longer and electric resistance heating kicks in. The result is increased usage and high prices. The map below shows real-time wholesale electricity prices at 5:40 PM on January 2. 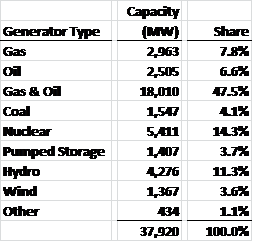 As is typical, electricity prices are higher in the eastern part of PJM (PJM-East), where most of the load is located, than in the western part of PJM (PJM-West), where most of the generation is concentrated. 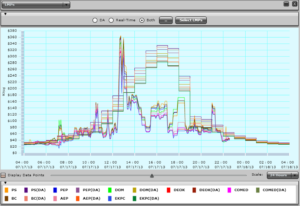 Real-time prices differences in PJM are a result of the costs associated with transmitting electricity from generating facilities (source) to load (sink) and the related line losses. On the map, the price scale in the bottom left corner of the map is in dollars per megawatt-hour ($/MWh). The east-west differentiation in prices is dramatic. The table below shows prices in dollars per megawatt-hour ($/MWh) and dollars per kilowatt-hour ($/kWh) for six delivery zones. 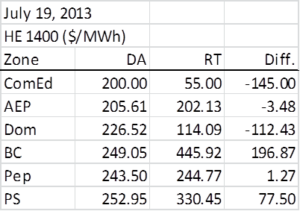 For comparison, real-time wholesale prices in PJM averaged $31.21/MWh or $0.03/kWh during 2012. Summer electricity prices also tend to be substantially more volatile than winter prices. But, extreme weather, hot or cold, can drive price volatility and at times, winter prices can exhibit strong volatility. Below is a dramatic example. 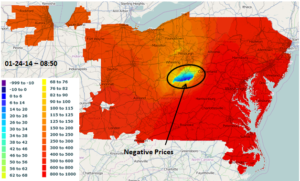 While prices in North Jersey (PSEG Zone) were high, around $500/MWh, prices in West Virginia and western Virginia were negative. This was a result of transmission constraints brought about by the heavy demand in PJM-East and the inability of many coal fired generating plants in PJM-West to ramp down quickly. In other words, while there was great demand for electricity in PJM-East, there was temporarily insufficient transmission capacity to move electricity from west to east. These transmission constraints developed more quickly than generation in PJM-West was able or willing to curtail their output. The result was that, rather than receive revenues for their output, generators had to pay to deliver their energy into the system. After a continued day of volatile prices, by 11:35 PM electricity prices had moderated significantly over the entire grid. As shown on the graph below, prices had fallen to the $20/MWh to $40/MWh range. …and more volatility. At 2:05 AM on Friday, January 3, less than three hours after the snapshot above, prices spiked, exceeding $700/MWh in northern New Jersey. 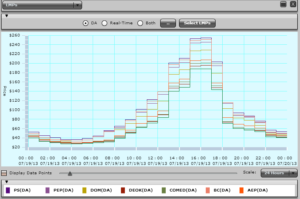 This graph shows PJM total system wide load over the day. Peak demand was 128,611 MW. 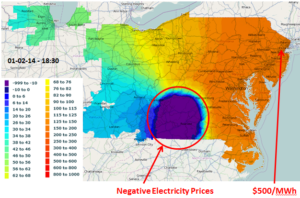 Note: Electricity price data and graphs from PJM.com. PJM operates two markets for energy, the Day-Ahead (DA) Market and the Real-Time (RT) Market. PJM’s Day-Ahead Market is a forward market in which hourly LMPs (locational marginal prices) are calculated for the next operating day based on generation offers, demand bids, and scheduled bilateral transactions. 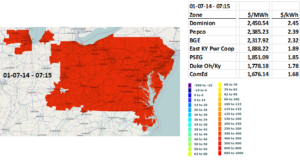 PJM’s Real-Time Market is a spot market in which current LMPs are calculated at five-minute intervals based on actual grid operating conditions. How do the two markets relate? Let’s use July 19, 2013 as an example. 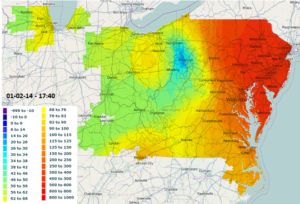 During the day before (July 18), load serving entities (electric distribution companies and retail energy providers) submit to PJM their electricity usage forecasts for their load during July 19. 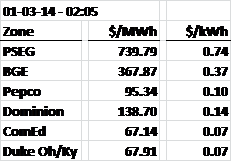 These forecasts, provided in one hour increments, together represent the aggregate PJM demand forecast for the delivery day, July 19. Also, during the day before (July 18), electricity generators submit to PJM offers to supply energy during the delivery day, July 19. 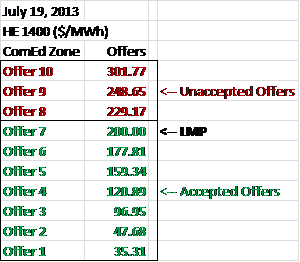 These offers, also provided in one hour increments, together represent the total pool of supply PJM has available to match supply to demand. Offers are zone specific. Through its “least cost” dispatch model, PJM then sorts through the generators’ offers, accepting, for each one hour period for the delivery day, the least expensive offers first and then incrementally more expensive offers until it has enough supply to meet the forecasted demand. 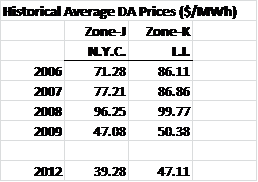 The graph below shows the Locational Marginal Prices (or the highest accepted offers) for each of the 24 hours of July 19 by selected zone. Note that the vertical scale spans $0 to $240. Then, reality happens. Despite the best efforts on the part of retail energy providers to project usage, actual demand levels vary. The weather is cooler or warmer than expected, commercial and industrial facility activity levels differ from what was projected, transmission lines become congested, substations fail. Demand for electricity within PJM peaked at 156,944 megawatts at hour 1420 (2:20 pm). During the delivery day, when actual demand is greater or less than what was procured in the Day-Ahead Market, energy is purchased or sold in the Real-Time Market to instantaneously match supply and demand. Prices in the Real-Time Market during the hour ending 1400 were as presented below. Note that in some zones the Real-Time price is higher than the zonal Day-Ahead price while at the same time, in other zones, the Real-Time price is below the Day-Ahead price. Prices in the Real-Time Market over the full 24 hours of the delivery day of July 19 for select zones are presented below. The vertical scale now spans $0 to $500. Because prices are set every five minutes, prices in the Real-Time Market are more volatile than in the Day-Ahead Market, where they are set on an hourly basis. In the Mid-Atlantic, July 19 was the fifth day of a heat wave. Below is a contour map of Locational Marginal Prices as of 1605 (4:05 PM). 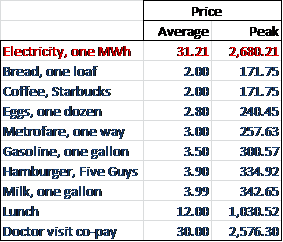 Below are both Day-Ahead and Real-Time prices during July 19, presented on one graph. During this day, Real-Time prices were often higher than Day-Ahead prices. This is not always the case. 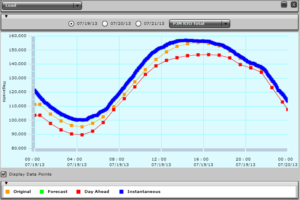 Below is a graph of Real-Time and Day-Ahead prices during July 17, 2013. – Surface Heat Index map from Plymouth State Weather Center. 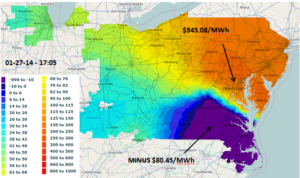 – Other data, maps and graphs from PJM. Please feel free to share this story. If you do, please email or post the web link. Unauthorized copying, retransmission, or republication is prohibited.